Jon Berkeley was born in Dublin and began drawing at the age of two. Jon has worked for over twenty five years as a freelance illustrator, cartoonist and occasional columnist in Sydney, Hong Kong, London and Dublin, and now lives in a small town near Barcelona with his wife, Orna, and their five children, along with nine cats (at the last count) and two vintage dogs. He illustrates for Time magazine, The Sunday Times, Newsweek and The Economist among many others, and writes when he’s not illustrating. Here’s Jon Berkeley’s website and blog. The Bell Hoot Fables — (2010-2011) Ages 9-12. Publisher: “You are the lucky winner of a Blue Moon Once-in-a-Lifetime Adventure. It’ll be the trip of a lifetime! The tour leaves from the Blue Moon office at 11 p.m. sharp. Groups of seven only. No pets.” When the Flints win the trip to Bell Hoot, they board Captain Bontoc’s Blue Moon Mobile with the expectation of a grand holiday. 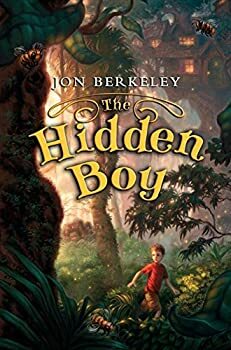 Then something terrible happens: Bea Flint’s little brother, Theo, disappears on the journey, and the peculiar Ledbetter clan of Bell Hoot, who call Theo the Hidden Boy, is more desperate than even Bea and her family to find him. Bea will have to trust herself and the weird and wise words of an old man called Arkadi in order to find Theo. In her search, she’ll discover that Bell Hoot is more than a vacation destination, a wish is no good unless you give it legs, and Mumbo Jumbo is much more than nonsense — it’s hidden potential that she can find within herself. Jon Berkeley sends readers on the adventure of a lifetime with this first installment of a saga about a mysterious place called Bell Hoot, where strange and wonderful things happen. Bea Flint’s family has won “the adventure of a lifetime” for seven people, so they grab Phoebe from next door, and Gabby, the clockwork girl who’s always lived in their house, and board the submarine bus for Bell Hoot. But while the bus is under water, Bea’s brother Theo disappears with a “pop.” When Bea and Phoebe set out to find Theo, they discover that Bell Hoot is not a normal vacation destination, that Bea’s family is not quite normal either, and what “the adventure of a lifetime” really means. The Wednesday Tales — (2006-2009) Ages 9-12. Publisher: Miles Wednesday, orphaned, unwashed and living in a barrel, has never been to a circus before — but then the Circus Oscuro is no ordinary circus. There’s a strange beast called The Null and an array of sinister-looking clowns, and when an unusual little girl with wings falls from a tower during the performance, Miles’s life is changed forever. As Miles and Little embark on an extraordinary journey to rescue two friends who have been captured at the Palace of Laughter, they discover nothing less than the power of friendship and the gift of family.